Thrilled to have a filmed interview of Gao Xiang by Jonathan Kearney, artist and Postgraduate Programme Director at Camberwell College of Arts. Stay tuned for the video. Thank you to Guzel Photography Services for making this fun time-lapse video of the team installing Gao Xiang's first U.K. exhibition in Oct-Nov 2017. So many good memories. Gao Xiang: Interrogating Dreams balances between dreams and reality, East and West. Showcasing for one week only, the show is a rare opportunity to view the works of this internationally acclaimed Chinese contemporary artist in London. 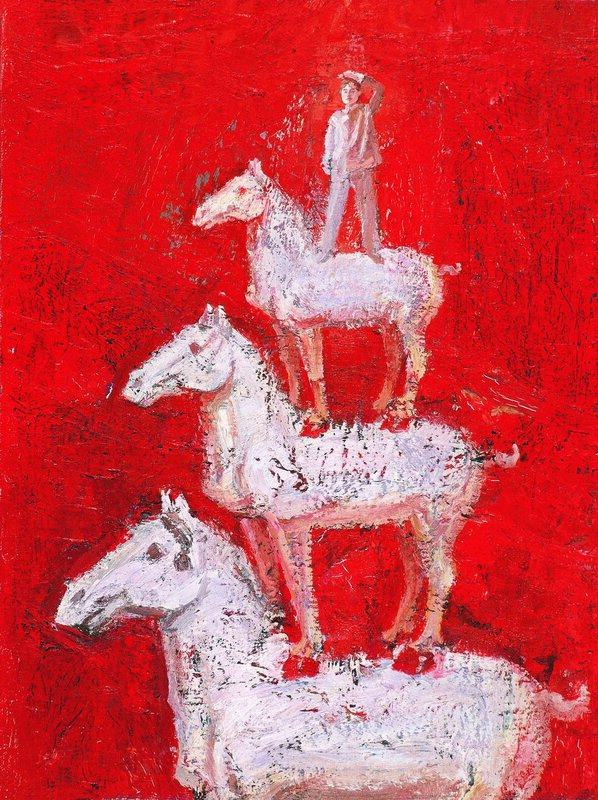 Gao Xiang examines the human spirit, felt in the timelessness of his landscapes and the imagery of animals, especially the horse. For Gao Xiang, the horse is an extension of his soul and a symbol of the universe and Chinese traditions. The horse has a dominant role in Chinese tradition and history. In the Pagoda of Horses subset of the Dreams series, Gao Xiang renders the horses in the form of Tang Dynasty terracotta figurines stacked as a pagoda, a symbol rich in cultural and Buddhist meaning. Painted in red, white and black - a reference to traditional ink pigments - the pagoda of horses symbolises the sprit of the seasons, the strength of tradition and its place in contemporary society, and also the human spirit. Sometimes pictured atop the horse pagoda is a small figure of a man, standing on the millennia of history, straining to see far into the future – his and all of ours. For Gao Xiang, the horse is also a mystical force representing both the universe and his soul. It is a power that can be contained or unleashed, gentle or ferocious. This strength is often contrasted with the much smaller figure of a man. Gao Xiang's installations follow the theme of his paintings while exploring the interaction between the object and its environment. The transparency of glass allows for almost infinite experiential immersions as the work influences the background and the background influences the perception of the work. Gao Xiang's landscape paintings interrogate dreams through the power and movement of ancient trees and the timeless grandeur of the cliffs and coastline in Normandy and China. "Set off by the magnificent and mutable sky and sea, the white cliffs can have an infinite variety of tones, but ... around noon ... in the stable light, the colors of the cliffs do not change and there are no hints of the passage of time." Very powerful horse pagodas. They speak to the heart and soul. Most powerful exploration of the unconscious. Exciting and stimulating. So beautiful. The horses look as if they have souls.